Not many things are quite as satisfying as hand assembling your own AR15 upper assembly. This complete do it yourself upper assembly build kit, contains everything you need to except for the bolt carrier group and charging handle. Once built this upper receiver assembly is ready to attach to any Mil-Spec lower receiver. 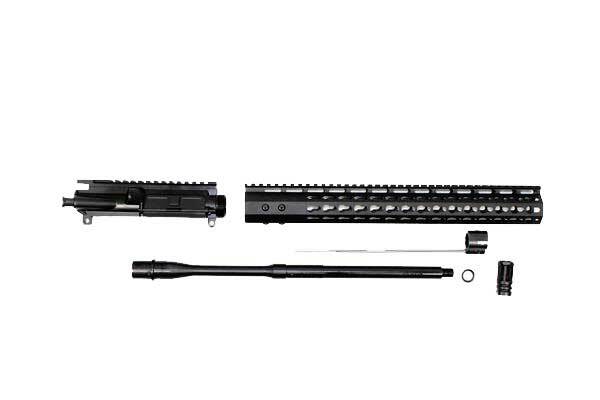 This build kit includes a 16 inch, 4150 chrome moly barrel that has a black nitride finish. The upper receiver is a forged M4 flat top upper, allowing you to easily attach rifle scopes and red dot sights to the picatinny rail. It is outfitted with a 13″ Gen 2 Keymod handguard that features strong attachment points for accessories resulting in accessories and optics having an excellent return to zero capability when detached and reattached. I’ve never assembled any gun parts before, but I’m pretty handy working on bicycles, and carpentry. I didn’t have any problem with this. You’ll need a torque wrench, vice block to hold the lower steady, and I used a Snap-On adjustable crow foot 3/8″ wrench for torqueing the barrel to the receiver. I put it on a Palmetto Arms lower, and it fit perfectly, the black anodizing was a flawless match. Easy to take an inexpensive wrench, such as open ended or a combo type and using a surface grinder, narrow the width to fit. Shadetree mechanic milling machine! E1-3, A1-A9, T1-T8, H2,T2- T7.